Beyond What's Known, a solo exhibition by Michelle Zassenhaus, presents a handful of photographic surveys of the Rockaway Peninsula. The show, presented at the beachside in Fort Tilden, is closing as the beach is opening for the summer. Refreshments served. ROCKAWAY ARTISTS ALLIANCE is proud to present a solo presentation of work by Michelle Zassenhaus, the winner of our 2018 Solo Show Competition. Zassenhaus’ work in Beyond What’s Known is the culmination of a “self-styled” residency the artist completed at Rockaway Beach this winter season. Whilst grappling with life-changing events, for which the show is a metaphor, Zassenhaus creates a handful of personal surveys of the landscape at the water’s edge. 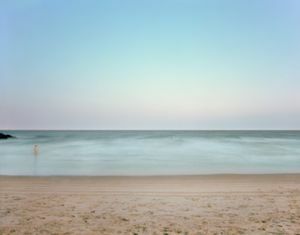 Through her characteristic large-format long exposures and other photographic techniques, Zassenhaus captures the “signature” of the place that is Rockaway, an area which, unbeknownst to many, sits within the New York City limits yet presents an entirely different setting than that for which New York City is typically known. In her series City Meets Sea (as in #16 (Rockaway Beach)), Zassenhaus’ human-scaled images, at 60x75” seduce the viewer in their ephemerality reminiscent of color field paintings. Another series on the same subject features images created by a camera left overnight, resulting in striking 10-hour exposures. In other work, Zassenhaus explores more inland qualities, noting “At night, I sense a quiet solitude. The ocean ebbs in the moonlight. Tightly nestled houses of architectural miscellany lurk quietly in the dark, only the occasional glowing window suggesting people within. Above, you’re serenaded by the relentless roar of low-flying air traffic destined for the nearby airport, one of the busiest in the country.” The result is a series of long exposures that depict the quiet neighborhood and transform the air traffic into beautifully patterned trails through the night sky. Finally, Zassenhaus presents several “sketches”, titled Ways of Telling Time, as the artist plays with how time is measured by light, decay, and ritual. Beyond What’s Known is Zassenhaus’ exploration of one’s own limits within the boundaries of the city’s largely unexplored outer limits, a place of unique beauty captured in the timeless medium of photography. MICHELLE ZASSENHAUS (American, b.1974) lives and works in Brooklyn, NY. She received her BFA in Art Photography from Syracuse University’s School of Visual and Performing Arts. Her photographs have been exhibited across the United States. Her work has been recognized by Photo District News, L’Œil de la Photographie, and Don’t Take Pictures. This is her debut solo exhibition.